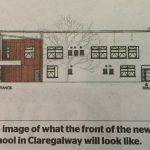 Population growth spurs major school projects – Three new buildings for Claregalway. Posted August 2, 2017 by Josette Farrell in News. 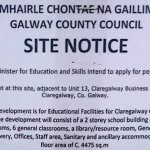 NOT one, not two, but three new school buildings are being planned for Claregalway. This will result in many millions of euro being invested in what is still referred to as a village, but which has a wide catchment area in terms of education. 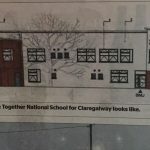 A purpose-built two-storey school for Claregalway’s Educate Together NS. a two-storey extension to Colaiste Bhaile Chláir secondary school and a new six classroom block for Claregalway NS are all with Galway County Council’s planners. The developments are an indicator of the population growth in the area over recent years and the demand for school places at both primary and secondary level. Claregalway ETNS opened in 2005 with 29 pupils and in September it will have 158 pupils enrolled. It has been operating in a building that was initially built for residential purposes and there has been a long running campaign to have a purpose-built school. 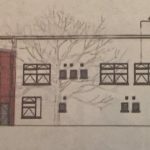 Letters supporting the planning application have been submitted by a number of groups, including the school’s parents’ association which points out that the temporary premises is no longer fit for purpose. The current ETNS in Claregalway is located beside the Society of African Missions (SMA) building on the outskirts of the village and Fr. Eamonn Finnegan has added his support to his education neighbours in their campaign to have a building of their own. He says that the school and SMA have worked together over the years and have shared facilities. “We’ll be sorry to lose them as neighbours but we see it as essential that they have space for a growing school,” he said in his submission to the planning department. The new school which will be on a site adjoining Coláiste Bhaile Chláir will be a 16 classroom two-storey building with a two classroom special needs unit and GP hall. The school’s Board of Management believes that given the big rise in pupil numbers a “future proof” building is needed for the school. Even pupils themselves have written to the local authority in support of the application for their new school. The school’s student council argues that they need more space, bigger classrooms, playgrounds, pitches and a stage. Over recent years as the school numbers grew, events and performances were held in the SMA hall while other activities had to be curtailed. Meanwhile, numbers are continuing to grow in Claregalway NS. Planning permission has been sought for a single storey six classroom standalone block with Special Education Teacher (SET) rooms to the northern end of the existing school property. The area’s secondary school, Coláiste Bhaile Chláir, run by Galway Roscommon Education Training Board (former VEC) has prove to be a huge success and continues to attract large numbers. The latest development will be the third phase of extensions to the school. The second phase that provided a significant increase in classrooms numbers opened towards the end of last year. 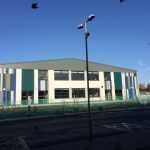 The next phase will involve the construction of a two-storey extension to include a two classroom special needs unit and a sports hall.